The book is only published in eBook format (2017). Pieter Raaff was the most experienced frontiersman in Africa during the 19th Century. His exploits and involvement in battles and skirmishes read like fiction. With his home language of English and Boer background he was an enigma of the time. Raised in the Orange River Colony, at the age of sixteen he fought with the Freestaters in the 1865 Basuto War. Raaff was wounded during a daring raid on the summit of the Thaba Bosiu mountain stronghold. In 1878, aged 29, he raised a corps of rough but ready mounted 'Rangers' for the Sekukuni Campaign. 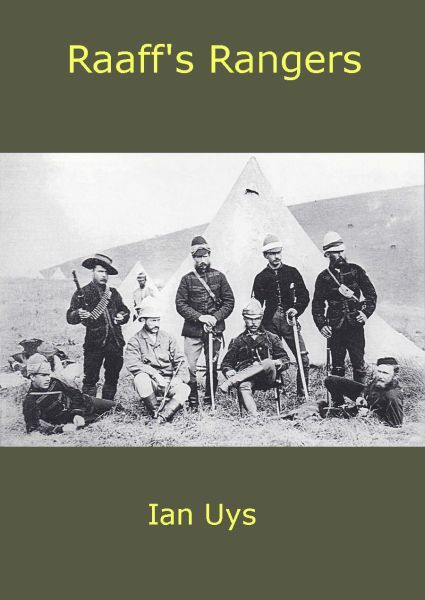 After serving there they were then diverted to fight in the Zulu War with Colonel Wood's flying column. Raaff's Transvaal Rangers proved their worth in action at the Hlobane Mountain, Kambula and Ulundi. Due to an underling's financial error Raaff was denied the Zulu War Medal, however was decorated with the CMG for his valuable services. He married after the war and settled in the Freestate. Raaff sought a military career, so accepted the appointment as commandant of Chief Sepinare's kraal near Thaba Nchu. They were surprised in an attack one night and he narrowly escaped with his life, then rode to Bloemfontein for help. Raaff became the magistrate at Fort Tuli, then during the Matabele War led a column in the taking of Bulawayo and the pursuit of King Lobengula. After Major Alan Wilson and his men were killed near the Shangani River the remaining force under Major Forbes were threatened with annihilation. The men rebelled and placed Raaff in charge. Raaff extricated the survivors from impossible situations and led them back to safety, for which he was personally thanked by Cecil Rhodes. His mysterious and untimely death which followed will always remain a mystery - implicating Dr Leander Starr Jameson, who would two years later lead the raid which gave impetus to the commencement of the South African War. From 1974 to 1994 Ian farmed in the Heidelberg area. As a member of the Heidelberg Commando, Ian Uys met the grandsons of those he writes about. He was a sergeant for some years in the commando, and served as acting platoon commander in the South West Africa/Namibia operational area. He was a co-founder of the Military Medal Society of South Africa and is past chairman of the S.A. Military History Society.